So, What is a Forensic Accountant? When I tell people that I am a forensic accountant, the first question I am usually asked is – “So, do you look for all the hidden money?” And while sometimes we get to be the pocket-protector version of James Bond and search for hidden funds in a secret offshore account, that is not what forensic accountants typically do. Rather, we are here to determine the parties’ income, value the parties’ estate, and assist in dividing the estate. Going through a divorce can be one of the lowest and messiest times in a person’s life. And “messy” doesn’t even begin to describe what happens when you start to muddle through all the financial pieces, which is why we are here! Forensic accountants in a family law setting provide litigation support services to parties going through a divorce or dealing with custody and paternity issues. Typically, divorce attorneys will advise their client when a forensic accountant is necessary, and will help the client find the right accountant for his/her case. While forensic accountants can work with both spouses jointly as a “neutral”, more often than not we work with just one party and his/her attorney. As forensics, we are here to help our client understand his/her financial position before, during and after the process. We do not do bookkeeping, business management, taxes or any other typical CPA work, although many of us are members of firms that provide these services separately. We are strictly here to help sort out the financial issues which arise in a family law setting. Trace any pre-marital property to its current location and value. Often times, both spouses will engage his/her own forensic accountant, and the two forensics can meet in the context of settlement negotiations with attorneys from each side. In the settlement process, we typically discuss our calculations of the value of the parties’ assets, the child and spousal support payments that should be due from one party to the other (if any), and other financial issues. This process can take anywhere from months to years, depending (in part) on the size of the estate, the income of the parties and the complexity of the legal issues involved. If the divorce is very contentious, and one or both of the spouses are very quarrelsome, the process slows down considerably and is sometimes completely thwarted. If a settlement is not reached, forensic accountants help our clients move forward to trial. At trial, we are usually assigned the role of expert witnesses to testify to our opinions about the disputed financial issues in support of our client’s case. But hopefully, it doesn’t have to be this way! What Situations Require a Forensic Accountant? Not every divorce requires a forensic accountant. If you and your soon to be ex can agree on support, the division of your property and other financial issues, you probably don’t need a forensic accountant to tell you what you can already agree upon. You or your spouse entered into the marriage with significant separate assets or liabilities. Clients are often surprised to find out that they won’t be able to continue to maintain the same lifestyle they did during their marriage. It is rare that a couple has enough money to be able to fund separate post-divorce lifestyles equal to the lifestyle they shared. You might not be able to afford to stay in the house, keep the country club membership, or vacation in Europe for 10 days each year anymore. Consider the value of the “thing” you are fighting for versus the cost of having the fight. Things can be replaced or replicated. I have seen many people pay in professional fees more to fight over an item than the item was worth. Try not to get emotional about such items – the fight could cost you several times the value of those items, and there is no guarantee that you will win! Know that divorce is a process with a beginning, middle and end. You won’t be getting divorced forever. One of the most frequent things we hear our clients say is how difficult planning their financial life is with all the unknowns of a divorce. Sooner or later, your divorce will be over. And hopefully, it will be over easy! 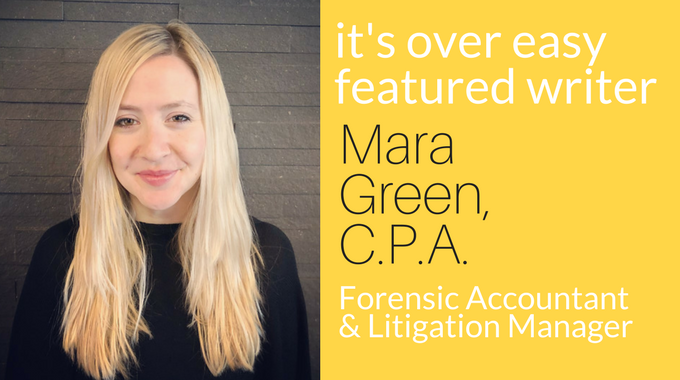 Mara is a Forensic Accountant based in Los Angeles. She is Litigation Manager at CMM, LLP.She is a Certified Public Accountant in the state of California and earned her Bachelor of Arts in Business Economics, Accounting from UCLA. You can reach out to Mara at mgreen@cmmcpas.com.